Aside from his personal investment in the case, and his loyalty to the President, Verrilli deeply believes that the law is important to secure health insurance coverage for millions of Americans who otherwise cannot afford it, and he knows that the next few minutes could determine their fate. The Courtroom is packed, and the atmosphere is tense with anticipation. The press gallery on the Courtroom’s left is full. Nina Totenberg of NPR and Adam Liptak of The New York Times are there. Recently retired Justice John Paul Stevens and Bush Administration lawyer David Addington are among the special guests in the box to the right reserved for the Justices’ guests. The Marshal’s cry of “Oyez, Oyez” and all the proceedings that follow are piped down to the main press room (Room G42), which is a floor below, in the building’s northwest corner. Reporters and producers are crowded around desks waiting for hard copies of the decision to be released. Other reporters are on the Courthouse steps, standing by to announce the ruling as soon as they hear from colleagues in the press room or receive copies from runners. CNN’s strategy for covering the decision is to use its established team, comprising a producer (who will get the opinion in G42) and their Supreme Court correspondent, who is waiting on the Courthouse steps. Both are experienced and very well prepared; they have done dozens of interviews about the case. Everything is coordinated through the network’s central control center in Atlanta, permitting the CNN web and social media teams to respond to the decision almost instantaneously. Fox has beefed up its team by flying in to Washington an experienced producer who previously worked extensively on the network’s Supreme Court coverage. After getting the opinion, the producer will talk to the Fox control room through a conference call. The network’s reporter is out on the steps, bridged into the call over her earpiece. Our problem at the moment is that someone is trying to crash the blog. At 10:00 exactly, hackers are launching a “distributed denial of service” attack with 1,000 page views per second to try and bring us down. It does not work; our tremendous Deputy Manager Max Mallory has spent months augmenting our capacity, and the hackers give up after a few minutes. We do not know how many readers are on the Live Blog for the opinion announcement; our data at the time indicates it is rapidly approaching one million. During the day, we will receive 5.3 million hits (more than ten times our all-time daily high) from 1.7 million unique readers. The Courtroom audio is also piped into the Solicitor General’s office at the Court. There, an Administration lawyer is waiting, Blackberry in hand. The White House, fearful that our Live Blog will crash under the load and perhaps unaware that electronic devices are not allowed in that office, has arranged for the lawyer to listen to the proceedings and send email updates every thirty seconds. At the White House, Barack Obama is in the Oval Office receiving the Presidential Daily Briefing. His principal advisors on the health care case are not with him. White House Counsel Kathy Ruemmler, Secretary of Health and Human Services Kathleen Sebelius, Valerie Jarrett, and other senior advisors are in Ruemmler’s office on the second floor of the White House. The communications staff is in Jay Carney’s office on the first floor, finishing their daily staff meeting. Downstairs in G42, the Court’s press room staff opens a huge white box and begins handing out the decision. Every reporter grabs a copy and races out. Bloomberg – which has cubicle closest to G42 – is the first to publish (10:06:46) that the decision has been issued. Joining veteran reporter Greg Stohr on the Bloomberg team are both Laurie Asseo (who previously covered the Court for years for AP) and Bob Drummond (Stohr’s predecessor). Stohr and Drummond begin reviewing the substance of the opinion. At their cubicles, the CNN and Fox producers pick up phones connected to their control rooms and reporters, say the decision is out, and begin urgently reading the syllabus – the summary of the ruling published at the front. The networks are treating the decision as breaking news, and alert their anchors to be ready. Upstairs, in the Solicitor General’s office at the Court, the Administration lawyer types out his first update. Inside G42, the press room staff hear the Chief Justice say over the speakers that the Court will have to confront the government’s arguments under both the commerce power and also the tax power. But none of the reporters hear him; they are all gone. The CNN and Fox producers are scanning the syllabus. 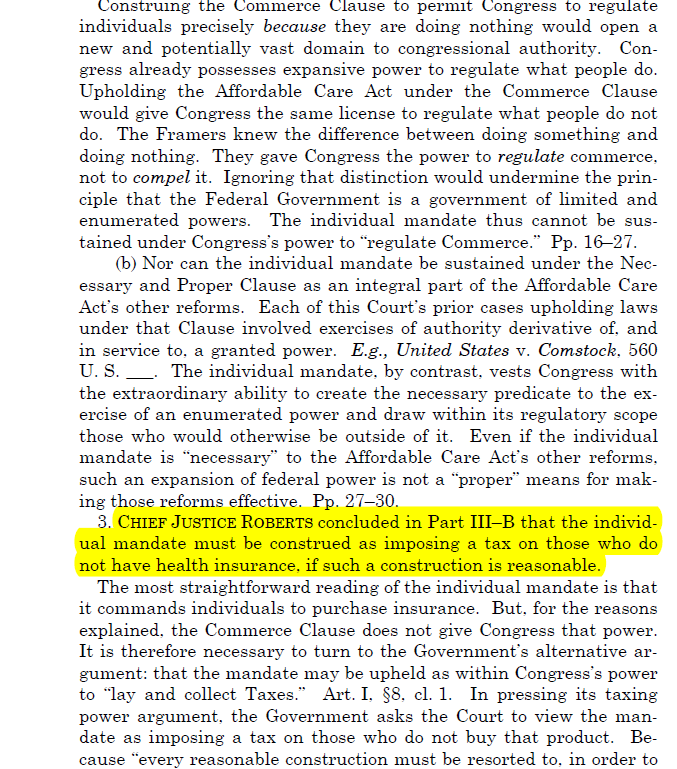 Eight lines from the bottom of page 2, they see the following language: “Chief Justice Roberts concluded in Part III-A that the individual mandate is not a valid exercise of Congress’s power under the Commerce Clause and the Necessary and Proper Clause.” They immediately and correctly recognize that sentence as fantastically important. The individual mandate is the heart of the statute, and it is clear that the Court has rejected the Administration’s principal theory – indeed the only theory that was discussed at great length in the oral arguments and debated by commentators. 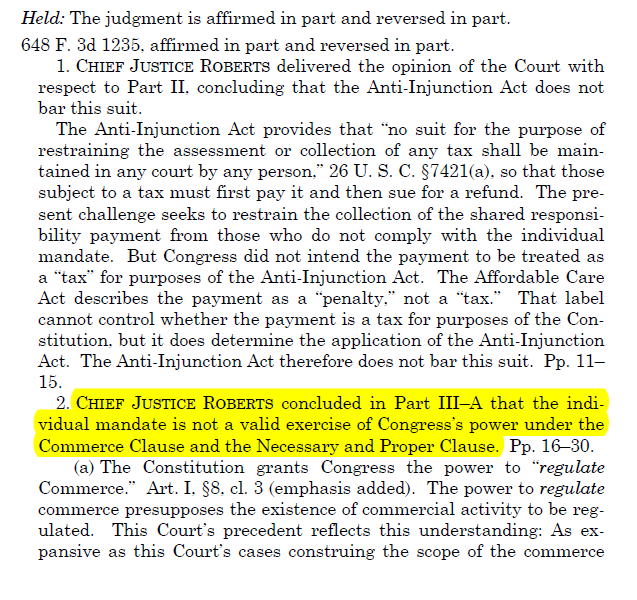 The Bloomberg team finishes its review, having read the Commerce Clause holding and then turned the page to see that the Court accepted the government’s alternative argument that the individual mandate is constitutional under Congress’s tax power. 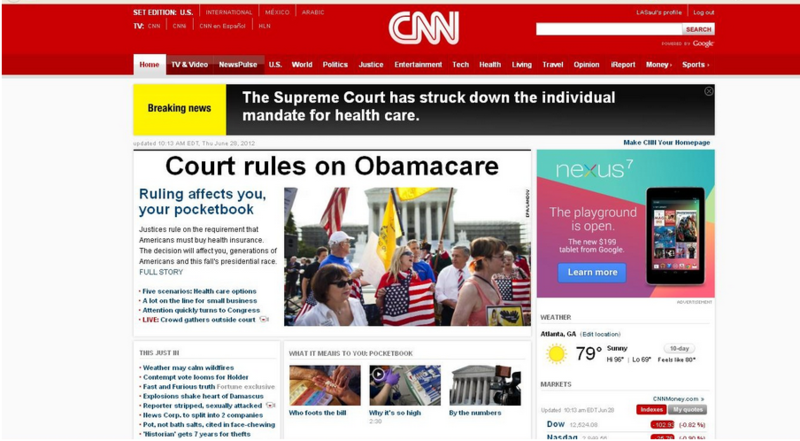 At 10:07:32 – 52 seconds after the Chief Justice began speaking – Bloomberg issues an alert: “OBAMA’S HEALTH-CARE OVERHAUL UPHELD BY U.S.SUPREME COURT.” Bloomberg is first, and it is right. Because the Act is important to stock prices, stock traders will have a very rare opportunity to arbitrage the conflicting media reports and the fact that no one outside the Court has the opinion. The market had been betting against the mandate surviving. That would have been bad for hospitals (which would lose revenues) and good for many insurers (which could be more selective in their customers). Now hospital stock prices begin to spike: Hospital Corp. of America, the nation’s largest private hospital chain, quickly rises from $27.38 to $29.35. 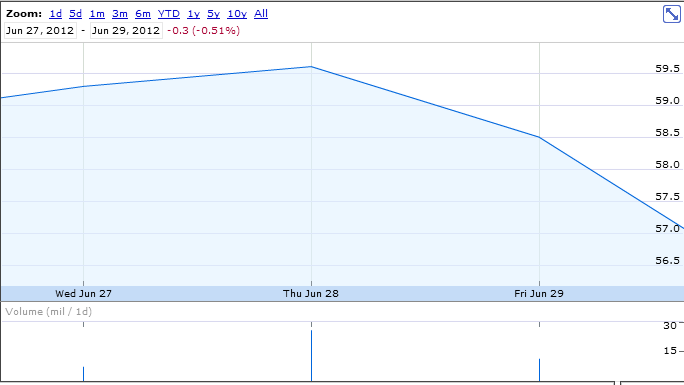 Many insurance stocks start to tumble: United Health Group falls from $58.69 to $55.73. Lyle Denniston has walked out of the press area and now reaches our team, reading one copy of the opinion and handing me the other. I type into the Live Blog that we have the opinion. Every other decision day of the Term, our Live Blog set-up is simple. Lyle dials into a conference call from his cubicle in the pressroom and tells our editor Amy Howe what has happened. Today, our entire team will work together in person, including Lyle, who is the most experienced member of the press corps, having covered the Court for more than five decades, and who has written about the case with incredible depth; and four lawyers who have collectively argued thirty-four Supreme Court cases and taught Supreme Court litigation at Harvard and Stanford for more than twenty years. And nothing will to go onto the Live Blog about the Court’s ruling until I say I agree with it. If we make a mistake, I will be personally responsible. Though our entire team (including Lyle) is now physically together, I keep our conference call going. I have invited the major news organizations and the White House to listen in, so I can talk them through what we know in real time. Or at least that is my plan. NBC, CBS, ABC, NPR, The New York Times, the Wall Street Journal, and the Los Angeles Times are all on. But I have forgotten two: CNN and Fox News. Within a few seconds of getting the opinion, I realize from reading the syllabus – and announce into the conference call – that the government has lost the Commerce Clause argument, but that there is much more going on that is going to require careful study. I say I am muting the line, so those on the line won’t overreact, and so I don’t feel the pressure of them hanging on what I’m saying. On the Live Blog, Amy tells readers that we are parsing the opinion ASAP. But it is already too late. CNN has been carefully orchestrating its transformation into a shockingly efficient news distribution company. They have been planning to saturate every screen in reach with this story as fast as possible, and the producer’s initial go-ahead pulled the trigger. 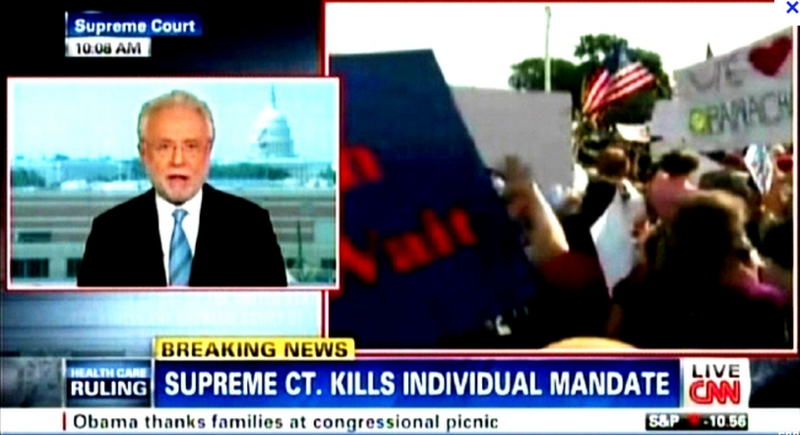 On the air, Wolf Blitzer is sending the coverage to the Courthouse steps. And as planned the reporter is putting her phone down to go on the air, which cuts herself off from the only CNN employee with access to the opinion. No less important, the network’s web and social media teams are plugged directly into the call through CNN central. They immediately publish unequivocal tweets and a breaking news email saying that the mandate had been invalidated. Fox has also assigned one of its most experienced and respected anchors, Bill Hemmer, to lead its coverage. 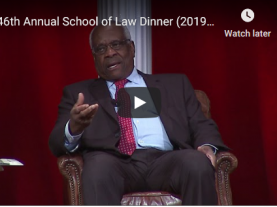 Having been given unqualified information, he now says decisively (at 10:07:50), “The individual mandate has been ruled unconstitutional.” (From 00:04- 00:09 in the video). CNN and Fox are both confident in their reporting. Television executives in CNN control rooms glance up at monitors carrying their competitors to see Fox’s banner, which confirms that the mandate has been struck down. The same thing happens in reverse at Fox News in Washington. In the critical early moments, the two networks’ errors reinforce each other. Unfortunately, neither network is paying attention to the wire services. In addition to Bloomberg’s early report that the mandate had been upheld, the other three principal wires that cover the Court – Reuters, AP, and Dow Jones – have issued similar alerts in rapid succession. 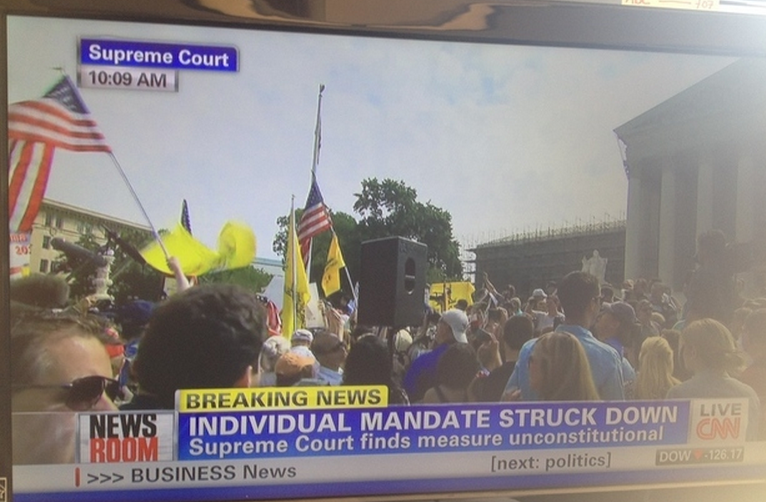 When AP’s Mark Sherman reports by phone that the mandate is constitutional, his editors look up and see the first CNN banner reporting the opposite. But they trust their reporter, and move the story. The bureau breaks into spontaneous cheers. By contrast, Fox has not fully integrated its electronic media into its broadcast reporting. 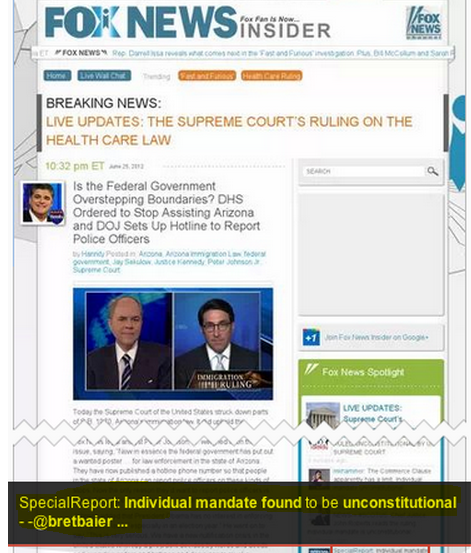 Its live blog reports, “Supreme Court finds individual mandate unconstitutional.” And the network’s chief White House correspondent and Bret Baier tweet to their followers that the mandate has been struck down. But the Fox web and social media teams otherwise lag behind the television coverage. There are no network-wide tweets or breaking news emails. Ironically, that inefficiency saves the network from more embarrassment. Upstairs in the Courtroom, Solicitor General Verrilli listens to the Chief Justice decisively reject the government’s Commerce Clause theory. For now, Verrilli is almost certain they have lost the case. He sits stone-faced, but he feels the ache of an imminent loss – mostly for those who would have had better access to health care under the law. It will be six long minutes more into Roberts’ bench announcement before Verrilli will get to feel the surge of emotion – beyond elation – from hearing that the Court has upheld the mandate under Congress’s taxing power. At the White House, the President of the United States has stepped out of his daily briefing into an adjacent room where he can see CNN and Fox News. He is about to learn the fate of a law that he believes is essential to the health care of millions of Americans, for which the Administration has sacrificed many other priorities, and which could be essential to his re-election. As he sees the banners flash across the bottom of the screens, it looks very, very bad. In Press Secretary Jay Carney’s office, the communications team has three principal sources of information: monitors showing the cable networks; our conference call on speakerphone; and our Live Blog on the computer. The announcements on CNN and Fox News in Carney’s office have been the first news of the decision, and both report that the mandate had been invalidated. Although the wire services have already reported the decision correctly, the communications team is not aware of those reports. The staff goes quiet, but it does not lose hope. On the conference call, I had said that the Administration had lost the Commerce Clause argument, but that there was more to the decision and that it was complicated. So they continue to listen to the call, and to watch the Live Blog. Waiting for further word, they do not send out an email even to the working group of the communications and Counsel’s Office teams. And they do not move to tell the President, unaware that he is watching the incorrect television reports. The experience is very different and much less anxious for the White House lawyers and the Administration’s policy team upstairs in Kathy Ruemmler’s office. There are no televisions in that office, so they are totally unaware of the reports seen by the communications team and the President that the mandate had been struck down. Instead, everyone is staring at Ruemmler’s computer and Jarrett’s iPad, which are on our Live Blog. 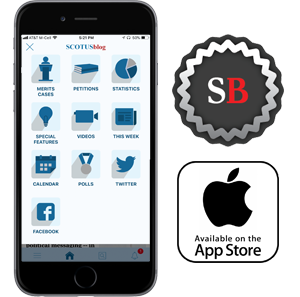 Across the street from the Supreme Court, Representative Jean Schmidt, Republican of Ohio, famously hears over her cell phone that the mandate has been struck down. It takes me almost one minute exactly to analyze the decision. After about twenty seconds, I am almost certain that the government has won under the tax power. But I worry the opinion itself would have important nuance or qualification. So I read all the first sentences of each paragraph in the critical part of the opinion announcing the tax holding. It is clear that although the Court has rejected the government’s Commerce Clause argument, it has upheld the mandate without qualification. I dictate to Amy: She repeats it to me to confirm, and publishes the update announcing the decision to our readers. I unmute the conference call line and repeat what we have just posted. I am confident that we have it right. And I feel relieved: The previous day I had published a prediction that the individual mandate will survive, in an opinion by the Chief Justice. During the first hour or so of the morning’s Live Blog, before the Court released its opinion, Amy had joked that if anyone was looking for me, I was out on my limb. The major theme of the comments beyond the conflict between our Live Blog and the television reports is a request for a link to the opinion itself. But it still will not be publicly available for almost half an hour. When we announce the decision, years of effort, followed by months of uncertainty after the oral argument, are vindicated for the White House. The team in the Counsel’s office is elated. They quickly agree that Ruemmler will deliver the good news to the President. She hurries to the Oval Office, a floor below. In quick succession, the White House communications team sees our Live Blog, hears our conference call, and receives the legal team’s brief “Victory” email (which it does not know was sourced to the blog as well). A member of the communications team responds to the email to flag the conflicting CNN and Fox reports, and the uncertainty about the ruling. This is the first the lawyers and policy teams know of the reporting that the mandate has been declared unconstitutional. And Ruemmler is on the way to tell the President. Jarrett immediately dispatches the White House lawyers to catch Ruemmler first, but it is unnecessary – she sees the CNN report on a television and stops herself. On the other side of the case, the plaintiffs’ lawyers – Paul Clement, who is in Florida, and attorneys from the Jones Day firm – are watching the Live Blog. They do not have a television on, so they are unaware of the uncertainty. None has any doubt that the blog is correct; each understood that despite an extraordinary effort, they have lost. Fox has named Megyn Kelly to co-anchor its coverage; having previously served as the network’s Supreme Court correspondent, she knows the Court very well. Kelly is carefully watching a computer, tuned in to the Live Blog. At 10:10:20, veteran CBS correspondent Jan Crawford – who has written a well-received book on the Court who had spent hundreds of hours covering the case – correctly reports on the ruling, just a few seconds before NBC’s Pete Williams (who had absorbed the decision in more detail during the walk from the press room to his camera stand). Back inside the Court, the CNN producer has recognized the significance of the tax holding, but is not initially definitive about the ruling, saying that the Court might be “splitting” the result. 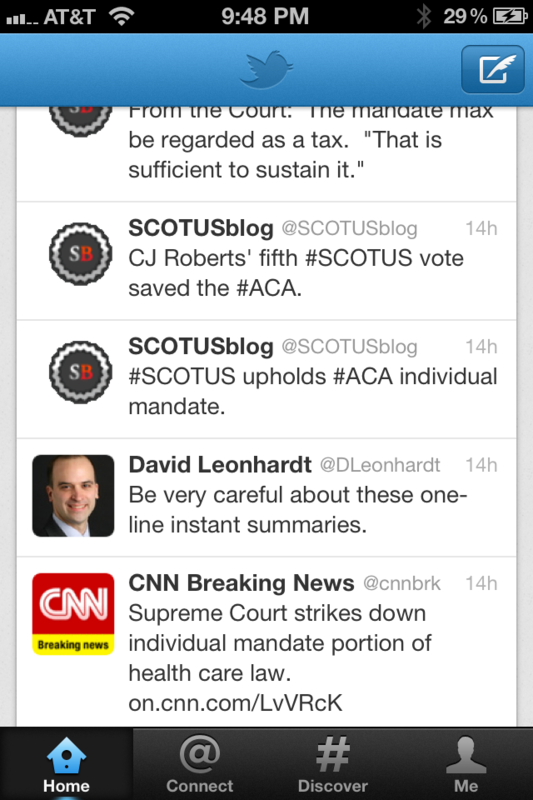 But the control room advises him that SCOTUSblog is reporting that the Court had upheld the mandate as a tax. Asked to confirm that report, the producer does. Given the conflict between the Live Blog and the television reports, the communications and legal teams are struggling to figure out whether or not the Court has upheld the mandate. Before going to see the President, they also need complete information on what the Court had done with the separate important challenge to the Act’s Medicaid expansion. But the White House is at a tremendous disadvantage. The Court’s website is not displaying the opinion, and so nobody in the White House can get a copy. And the email updates from the lawyer at the Court are no help, because the Chief is still talking about how the Justices have rejected the Commerce Clause theory. Between those two entries, a White House lawyer emails me a two-word question: “tax power?” I write back “Yes.” A lawyer in the Solicitor General’s office then finally gets a physical copy of the opinion, and confirms our report. The team concludes at 10:13 – roughly five-and-a-half minutes after the first CNN report – that it has the information it needs to tell the President that they had in fact won. Ruemmler walks through the first-floor halls, and gives him two thumbs up. He wants to call Verrilli as soon as possible. Everyone involved in the process worked diligently to distribute information quickly and correctly. They had very knowledgeable teams; among others, the CNN producer at the Court is widely recognized as among the most devoted and hardest working people in their bureau. But with the benefit of perfect hindsight, several things could have been done better. The Court went to significant additional efforts to make sure that the health care opinion would be available quickly on its website. But it should have had a better back-up plan, including distributing the opinion immediately by email to reporters and to the government much more quickly than it did (sending one at 10:29). The fact that the Court initially released the opinion only in physical form to the media at the Courthouse made it much more difficult for others to resolve the conflicting media reports. The White House could not review the decision to tell the President what had happened. And many millions of dollars were gained and lost in the markets based on which media reports traders and investors happened to be watching. Crawford quickly closed her first report from the steps by saying the Court “may have” upheld the mandate. After a break in which she read more and consulted with the attorney, she correctly reported the ruling, well before CNN and Fox clearly corrected themselves. Those errors were avoidable, and were in fact avoided by others. The wire services’ Supreme Court reporters were very experienced in breaking news reporting, and they got it right. Other news sources adapted: they simply sat out the uncertainty of the first few minutes (NPR and The New York Times), set up a system in which they would take the time to read the decision more carefully before reporting (NBC), or augmented their team with an expert (CBS). In a novel twist, C-SPAN had simply put the Live Blog on television. CNN in particular should have told its viewers and readers more quickly about its own serious doubts about its initial reporting. 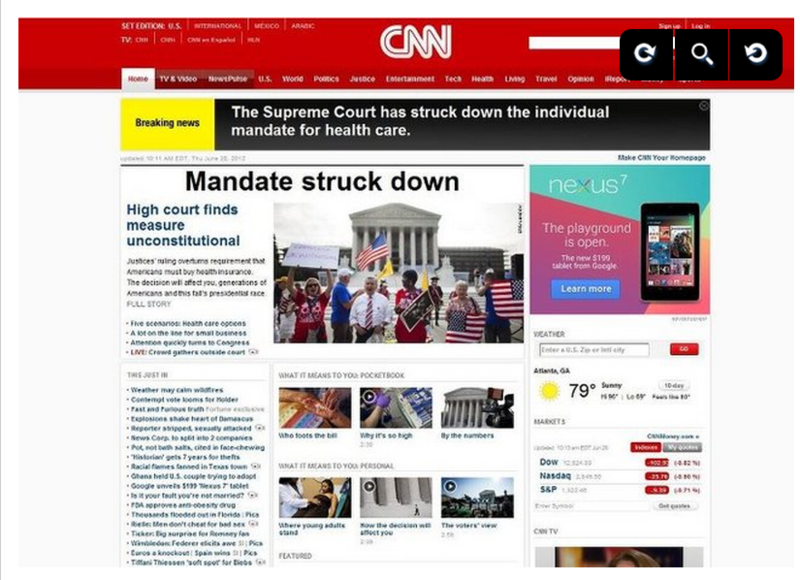 By 10:12 at the latest, CNN was alone in seriously suggesting that the mandate might have been invalidated. The network’s on-air team responsibly hedged throughout the entire process. But by 10:14, they should have been told not to claim that there were wildly conflicting reports about whether the mandate had been invalidated – the only reports on its side were its own, or echoes of its first reports bouncing around Twitter and blogs. Ironically, CNN reacted too slowly in part to avoid a second error. The network did not want to be in the position of reporting that the mandate had been struck down, then reporting that it was upheld, then reverting to its initial report. (That had happened to the media in the 2000 presidential election, and it had been a debacle.) CNN gravitated to an intermediate position of uncertainty on the air, which of course was not decisive enough to correct viewers’ initial impressions. CNN had also converted itself into an integrated circuit in which its electronic media teams were tied directly into the broadcast operation. But not anticipating the possibility of an error or confusion, its first web, electronic, and Twitter reports did not hedge. And the network did not have a clear plan to reverse the circuit on the electronic-media side and tell readers that its initial reports may have been wrong. It is difficult to say whether Fox should have instructed its hosts and reporter to hedge initially. The network’s experienced producer with the opinion stated with “100%” certainty that the mandate had been struck down. However, by that time the wire services were reporting exactly the opposite, and so I think the unequivocal tone of Fox’s first reports conveyed more certainty than was reasonable. But Fox was saved from further embarrassment by a combination of very good work and simple luck. 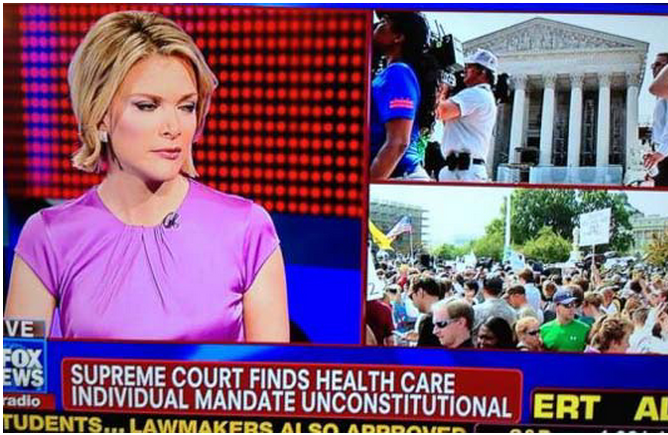 Although CNN and Fox both told their viewers about “conflicting” information, Fox’s broadcast was more decisive – only because of Kelly’s decision to monitor the Live Blog, and her willingness to state on open air in real time that “despite” the network’s report seconds before from the Court, another specific source was reporting the opposite. And because Fox had not directly integrated its web and social media teams, the network had much less to pull back than did CNN. The two networks’ responses to how Thursday morning unfolded are also a study in contrasts. Both got identical incorrect information from their producers inside the Court, who made mistakes despite their best efforts. 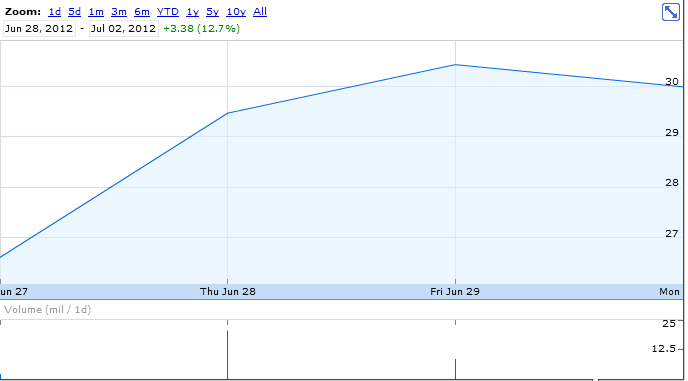 The reaction in some quarters at CNN has been apoplectic. But Fox – which like CNN is taking steps to avoid making a similar initial mistake in the future – generally views Thursday morning’s “transparent” broadcasting of information as it developed in real time as exactly how its reporting should function. At the White House, there is more to the story than the spin that the President believed the Administration had lost the case only for a very short period of time. In fact, for at least a few minutes he thought the opposite and for more than five minutes, he had substantially worse information than many Americans. That remarkable anomaly arose from the fact that the White House staff wanted to be sure to get him only correct information. With no way to get the opinion themselves, the staff performed incredibly well. Faced with conflicting reports from otherwise reliable sources, the communications and legal teams remained calm, resolved the uncertainty, and delivered accurate information to the President as soon as possible. The fact that it took a little longer than the White House has conveyed probably just reflects that no one in the building was standing around with a stopwatch. The chronology above is compiled from innumerable emails, tweets, and video clips. As for the blog, I feel that we showed that a specialized “vertical” – a deep team with focused expertise – can contribute to reporting. We helped the traditional media and the White House, and we distributed the information directly to the public. We also survived hackers, accommodated a record number of visitors, and had a chance to report on one of the most momentous decisions in recent history. And we had a blast doing it. We hope you’ll join us over the summer and next Term for more excitement. We promise to never stop working to improve this experience for you. Thanks for reading.